Happy Sunday everyone! I hope you are all enjoying your weekend! The tutorial I am sharing today was made for a very good teacher friend of mine, who is just starting out on PowerPoint. We were talking about the basics and I thought I would make a video (and maybe some more after this?) for people who are new to designing in PowerPoint. I have been trying to figure out how to do this!!! Just what I was looking for!! LOVE, LOVE this tutorial! You ALWAYS teach me something new!! Thank you my BOGGING HERO!! This is exactly what I needed. As always, thank you so much! LOVE when someone is willing to take the time to share!!!! THANK YOU soooo much! Thank you very much for sharing this! I, too, am a visual learner, and this is terrific! Thanks, again for taking the time to share this tutorial. Thanks for sharing!! I knew there had to be a way to group objects without selecting the whole page! Thank you for sharing. I hope to see more tutorials. 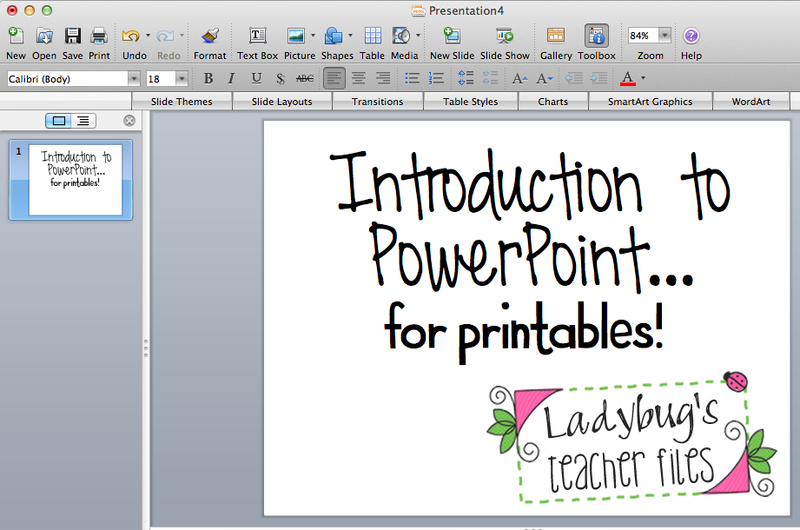 Perhaps you could do some how to get started using powerpoint tutorials for novices like me! Power point is so valuable, and so was this tutorial….thank you! All of your tutorials are so helpful. I was wondering….do you know how to upload pictures with the cute labels on them? For example, your photos would say "Ladybug Teaching Files" on them (on like a white banner). I've seen this look a lot now on the blogs, and would love to learn how to do the same for mine! Maybe a tutorial for this little trick?? Thanks Kristen! Awesome post! Just what I needed! Thanks! I'm new to ppt and only use it make my class newsletters. I wondered if there was a grouping feature since I know how to create Smart Board activities. I only know the basics so this video was GREAT. Please share more tips in creating ppt slides. Kristen??? Is this the correct video!?!? Thank you for the awesome video! It looks like I will have to get PowerPoint for my Mac- it seems to have more features than Keynote. I can't wait to start creating! Thanks for sharing!! It looks a little different on my PC, but I think I can make it work. It is good to know I am doing it right. It took me awhile to figure out that powerpoint is for more than presentations. I am having so much fun creating stuff! Thanks for sharing!! I've gone away from Word and have been using Pages for quite awhile. Maybe I'll give Powerpoint a try!! Do you know if you can have one file with the pages both horizontal and vertical? I'm still trying to figure out if this can be done in Pages too. Thanks for the tutorial. I have been blogging for about two months now and I think I am just about ready to jump into the TpT scene and this will be helpful! Oooh! This is great! Thank you! I can't get the video to work. It only comes up as a screen shot. What am I doing wrong? Hi, it's there, but might not be showing up in your particular browser or device (I can't see it on my iPad, but it shows on my laptop). Could you try a different browser to see? Thanks! Great information. I've only been blogging for a little over 2 months, and there's so much to learn. I am excited and sometimes a little overwhelmed by it, but I really appreciate your videos. They demostrate everything, and I can stop the video, go to PPT, and try it, then come back and watch some more. Thank you! I really appreciate having this resource. I am your newest follower! Is there a link missing? I am having the same problem as the LP. Thanks as always for your wonderful ideas. You make great things and I appreciate that you share it with the rest of us! Thanks again for all your fabulous work! I linked to this video tutorial on my Tips and Tutorials Page. I hope that is OK. Great tutorial! Thanks for another great tutorial – really helpful! Since I watched your last tutorial I've made so much for my classroom using powerpoint!! Thanks again for your website, I love it! This resource is awesome. Thanks for sharing! I started following you in my Reader! I have heard so much about making things in PowerPoint, but wasn't sure what the benefits were. I picked up many new tricks from watching! Thanks so much for sharing! I get so frustrated with creating files in Word. I'm going to play around with Power Point tomorrow! Thanks for the great tutorial!